This year, the competition will take place in host country, Brazil. To celebrate the event, the Monnaie de Paris has struck two cup-shaped coins: a €10 silver and a €200 1 Oz gold (a very limited non-cup shape 5 Oz gold coin is also being struck). 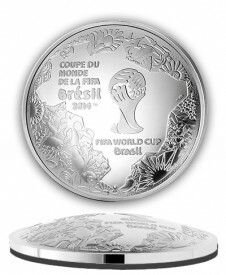 The coins’ graphic concept combines two different elements : the representation of Brazil and of the Maracanã stadium magnified by the use of the dome shape striking on the two 37mm coins (1 Oz gold and €10 Silver). The €10 Silver has a mintage limit of 10,000 coins. The €200 Gold has a limit of 500. The coins’ designs are characteristic of the Monnaie de Paris’ penchant for modern design and technical precision. The obverse depicts a map of Brazil delimited by stylized elements of flora and fauna. In the middle of the country map, the competitions logo and official name are represented.The reverse represents the Maracanã stadium in aerial view. The name of the stadium, the name of the competition and the RF mention are inscribed on the roof of the stadium. On the foreground, a ball on which the face value is written, springs from the stadium. The issue price of the silver coin is €64, while the 1 Oz gold is €1760. Orders can be placed on the Monnaie de Paris website. Monnaie de Paris possesses age-old expertise which it employs with great vitality and creativity. Heir to more than twelve centuries of tradition, Monnaie de Paris is responsible for the striking of circulating coins. It also produces collector coins, medals, official decorations and casts works of art. Engraving in metal the designs of many styles and eras, Monnaie de Paris entrusts the conception of its products to the greatest artists, and maintains a constant dialogue with contemporary artistic creation. Monnaie de Paris is the sole mint entrusted with the task of striking official French euro currency. It also strikes several foreign official currency coins, whether in their entirety (as in the case of Luxembourg, Monaco, and Malta) or in part (as for Greece, Bangladesh, etc.). To learn more about the mint, please visit the Monnaie de Paris official website.